Galaxies are often found in clusters, which contain many ‘red and dead’ members that stopped forming stars in the distant past. Over billions of years, galaxy clusters build up structure in the universe - merging with adjacent clusters. When this happens, there is a huge release of energy as the clusters collide. The resulting shock wave travels through the cluster like a tsunami, but until now there was no evidence that the galaxies themselves were affected very much. An international team of astronomers, led by Andra Stroe of Leiden Observatory and David Sobral of Leiden and the University of Lisbon observed the merging galaxy cluster CIZA J2242.8+5301, nicknamed the ‘Sausage’, using ING telescopes as well as the Keck and CFHT telescopes on Hawaii. The Wide Field Camera on the INT was used with a custom-designed set of narrow-band filters to identify candidate galaxies with ongoing star formation. On the WHT, the newly-refurbished Autofib-2 (AF2) was used to obtain spectra of 109 candidates to confirm and characterise the star formation activity. They find that, far from ‘watching from the back’ the cluster galaxies were transformed by the shock wave, triggering a new wave of star formation. Hα images of some of the galaxies in CIZA J2242.8+5301, made from images in filters that isolate the redshifted Hα light and continuum respectively (frames BB and NB). 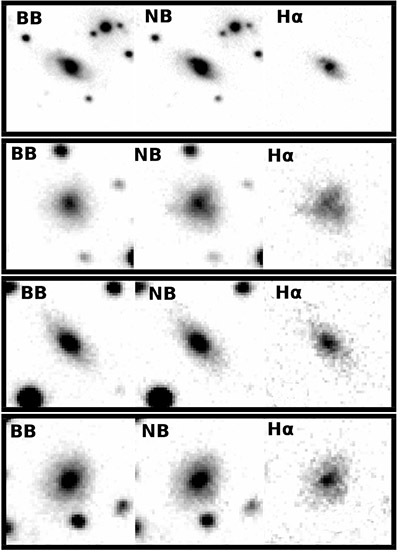 The rightmost images show the distribution of Hα light coming from young stellar nurseries [ JPEG ]. The new work implies that the merger of galaxy clusters has a major impact on the formation of stars: the shocks lead to turbulence in the galactic gas which then triggers an avalanche-like collapse, leading to the formation of very dense, cold gas clouds, which are vital for the formation of new stars. Star formation at this rate leads to a lot of massive, short-lived stars coming into being, which explode as supernovae a few million years later. The explosions drive huge amounts of gas out of the galaxies and with most of the rest consumed in star formation, the galaxies soon run out of fuel. The cluster mergers make the galaxies even more red and dead. Every cluster of galaxies in the nearby Universe has experienced a series of mergers during its lifetime, so they should all have passed through a period of extremely vigorous production of stars. Given that the shocks will only however lead to a brief (in astronomical terms) increase in star formation, astronomers have to be very lucky to catch the cluster at a time in its evolution when the galaxies are still being `lit up’ by the shock. David Sobral, Andra Stroe, William A. Dawson, David Wittman, M. James Jee, Huub Röttgering, Reinout J. van Weeren and Marcus Brüggen, 2015, "MC2: boosted AGN and star formation activity in CIZA J2242.8+5301, a massive post-merger cluster at z = 0.19", MNRAS, 450, 630. Paper. Andra Stroe, David Sobral, William Dawson, M. James Jee, Henk Hoekstra, David Wittman, Reinout J. van Weeren, Marcus Brüggen and Huub J. A. Röttgering, 2015, "The rise and fall of star formation in z~0.2 merging galaxy clusters", MNRAS, 450, 646. Paper. "Giant cosmic tsunami wakes up comatose galaxies", RAS press release, 24 April 2015.